We've been owned by other dog breeds before, but fell in love with Silkens and their lively personalities on our first encounter with them. There's an almost indescribable joie de vive about them that seems quite unique among sight hounds. Our dogs are our family, not just kennel animals kept for breeding. They love to ping pong off the sofas in the family room and co-exist peacefully (if not always sedately) with our Ragdoll cats. On occasion they visit our bicycle shop business and greet our customers enthusiastically - they seldom meet someone they can't charm completely. They love people and given a choice would much rather be our constant companions than relegated to the house or back yard. Scirocco Hounds is a non-profit kennel located in the Sierra foothills of East of Sacramento, California in the heart of the historic gold rush area. We hope you enjoy our website and our Silkens. Please feel free to contact us by phone or email. 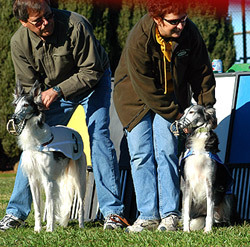 We'd love to welcome you to the wonderful Silken Windhound world!